Made from one of the most sustainable materials on earth, expert craftsmen fuse together several layers of bamboo until it's a solid 5/8 inches thick, perfect for all of your balancing, rocking, and tilting needs. Engage more muscle groups, burn calories, and increase circulation throughout your body with the Bamboo Motion-X Board. Stand for longer. Cushy and a full 9 mm thick, adding a Comfort Mat to your Bamboo Motion-X Board lets you reap the benefits of motion boards while adding an extra layer of support. Thermoplastic elastometer material, the same material used in most yoga mats, takes pressure off your feet and legs for even comfier standing. What is the difference between a motion board and a balance board? 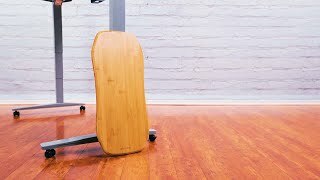 Balance boards allow you to balance at your desk, but motion boards encourage even more movement and give you even more health benefits, such as the abilities to burn more calories and work with better circulation. Our Bamboo Motion-X Board helps you achieve ideal movement at your desk, even more than you can get from standing and balancing in place. Yes, and if you're piecing together your ergonomic workstation, it's crucial to have products that give you the most options for movement for your work style and your office's dimensions. Standing more at your desk is just the beginning. The Motion-X allows you to discreetly balance, move, and surf throughout the day (even in most cubicles), giving your body what it needs in the moment. Is this a skateboard without wheels? No, although it might look similar in design to the classic skateboard deck, our Bamboo Motion-X Board's deck is thicker, making it perfect for users who wish to stand and surf in place. Stably stand and move more at your sit-stand desk to reap more benefits of health and productivity. Instead of wheels, the board comes with a molded domed base, the key component behind the Motion-X Board's motion. We think you'll agree, it'll feel more like surfing at your workstation than skateboarding. How do I use this board? To use the Bamboo Motion-X Board, set it on a stable spot in front of your workstation and take a single step up onto the board. After you acquaint yourself with the Motion-X's points of balance, step up with the other foot. Make sure you're holding on to a surface as you get used to the board. After you get the hang of balancing, rock back and forth and tilt to enjoy even more movement at your desk. Learn how to do the Rock, the Tilt, and the Swivel in our helpful instruction manual! Should I do something to protect my board and floor while I use the Motion-X? If your floor is made of wood, it's smart if you have a standing mat or small rug to use underneath the board to protect it and your floors from scuffing. We even have a standing desk mat that does the trick well. Which board should I get? Depending on how much motion you want while you stand, that will help you figure out which board is right for you. For subtle movements, try our E7 Motion Board, which gets you used to multitasking on a motion board. This board, our Bamboo Motion-X Board, is ideal if you want a little more dynamic movement, meaning you can move more from front to back and side to side, which engages your core even more than the E7. Or try our Fit Board, which offers stable standing and anti-fatigue protection in one! Add a Comfort Mat to your Bamboo Motion-X Board for even more support for your feet, legs, and entire body. The cushy mat installs via an adhesive strip and allows you to use the board with and without shoes. And when you're really into standing, this mat takes pressure off your feet and legs, so you can stand for longer periods of time. Stand comfortably with steadfast support with this 9 millimeter thick comfort mat at your feet. This product comes standard with a 1-year warranty. For more information on UPLIFT warranty coverage, click here.